The 3 stars hotel Le Pacha is located in the heart of the capital Tunis ,10 minutes from the International airport of Tunis Carthage . The hotel features 96 rooms on 3 floors. It's offers also a Main restaurant for hotel Residents offering Buffet service for breakfast and dinner, 1 a la carte restaurant for local and international cuisine and a multi-functional room, well equiped meeting room : internet;audio visuel equipements. HOTEL LE PACHA provides 96 rooms from with 48 are reserved for non smokings clients. 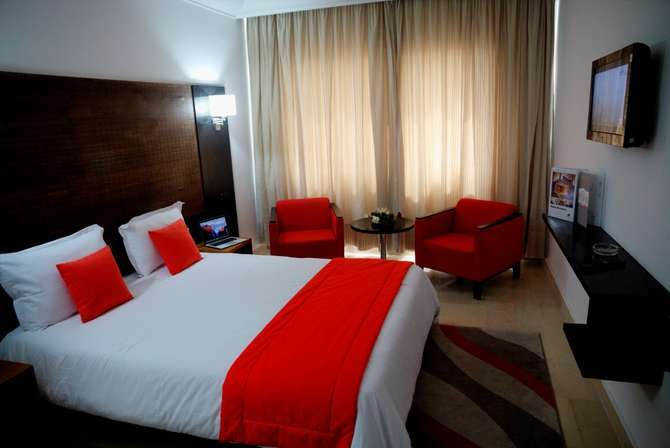 The rooms are well equipped and basically decorated. All have bath and are equiped with satellite TV, direct international phone and individual air conditionning. Hotel is located in the center of tunis at the crossroads of mohamed V and Keireddine Pacha avenues. It is close to the business district and belvedère park; it's 5 km away from Tunis Carthage International Airport and the medine ( old town) ; and 20 mn from Carthage archeological sites. The hotel offers 02 meeting rooms able to accomodate 05 to 40 pax. It provides a free car parking.